This is for approx. 2.5 oz. of such a PRETTY MERMAID Palette. ***TEN*** colors (1/4 oz. ea.) for a great selection. Beautiful undersea colors. Your greens, turquoise and sea blues, pretty pinks and purples round out this dazzling palette. A 1/4 ounce is about 12 - 14 inches long. 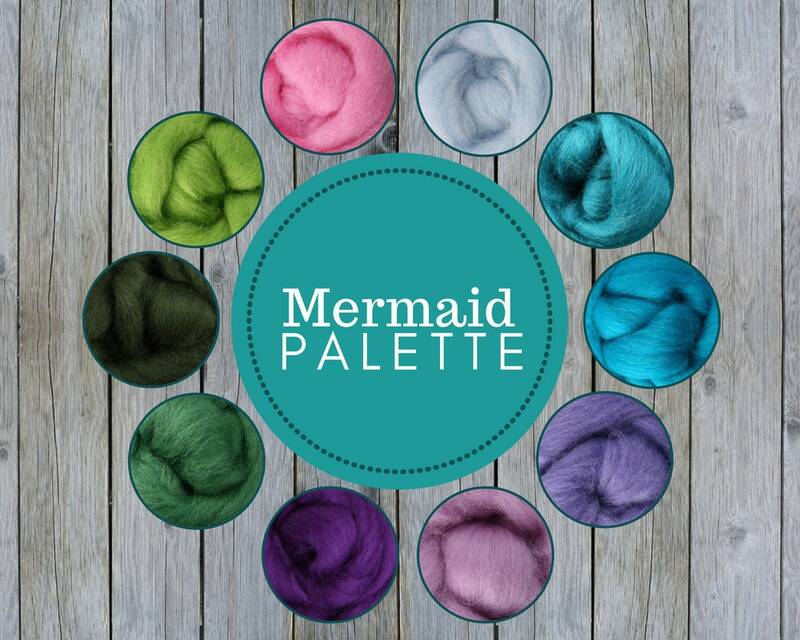 WATCH OUR YOUTUBE VIDEO ON HOW TO FELT SOAP, USING THE MERMAID PALETTE!!! Ashford Corriedale sliver is a 100% New Zealand product and by far a favorite wool roving for both traditional wet felting and dry needle felting. The wool is from pasture-fed sheep from farmers – some of whom have farmed the land for generations. They take great pride in the quality of their wool and the high standard of animal husbandry. The sheep are well cared for and are not mulesed. After the sheep are shorn, on the farm, the wool is carefully skirted and checked. Only wool that is sound, clean with good fiber length, bulk and color is selected. It is sent to a boutique New Zealand mill to be hand dyed, carded and combed. It is washed using an environmentally-friendly, biodegradable detergent. The wool is then dried and dyed. The dyes comply with the strict EU regulations and the roving can be certified under the "Oeko-Tex Standard 100". This standard is the most widely known standard for certification of ecologically-safe clothing.